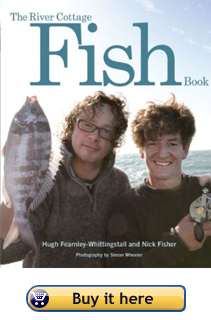 Written by the amiable Hugh Fearnley-Whittingstall and his mate Nick Fisher, who must be tired of all the jokes by now, ‘Fish’ will have you rushing out to your nearest fishmonger. This book’s a whopper, incredibly comprehensive, and everything about it feels right, from the section on catching fish, and gutting and filleting them, to the information about sustainable fish shopping. As for the delicious recipes, they’ll open you up to oceans of possibilities as you learn to grill, poach, fry, roast, or cook fish over an open fire. Make fabulous fish soups. Dress a crab. Smoke your own fish. If you’ve ever stood in front of the fish counter thinking how wonderful all those different fish look laid out on the slab, and then bought a couple of pork chops because you at least knew how to cook them, buy this book. Oh, lovely. I was a vegetarian for 20 years, and have only recently started cooking seafood. I’m okay at it, but I’d sure like to be better. Maybe I’ll pick up this book.